Coach Hill is a SW Calgary community located along Old Banff Coach Road. Coach Hill real estate includes detached homes, townhomes and condos. Here are the current Coach Hill real estate listings, and more information on this SW neighbourhood is below. Coach Hill is a quiet neighbourhood on the west side of Sarcee Trail. It is nearby West Springs, Patterson, Aspen Woods and Strathcona Park. Farther west down Old Banff Coach Road is the community of Cougar Ridge. Coach Hill is located in SW Calgary, up the hill from the Bow River valley. With its history rooted in the Calgary 1988 Winter Olympics, Coach Hill real estate has some unique properties with special stories. Condos were built to house guests and media from all around the world. Now Coach Hill is a quiet neighbourhood with quick access downtown or to the mountains. Bow Trail travels directly into downtown, and the Calgary Transit 69 Street LRT station is nearby. Trains travel through downtown and up to the NE. Connections downtown can take commuters down to the south or up to the NW, stopping at SAIT, ACAD and the University of Calgary. Buses run throughout Coach Hill and connect directly to the LRT station. 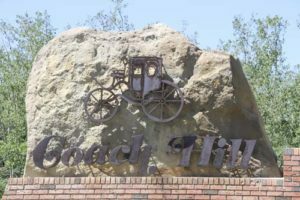 Coach Hill is nearby shops, services, schools and amenities. Ambrose University and Ernest Manning High School are located beside the 69 Street LRT station. There are multiple major shopping centres within minutes, including Westhills, Signal Hill and Aspen Landing. The mountains are a quick drive to the west, and Edworthy Park is just across Sarcee Trail. View all the current Coach Hill real estate listings above. Contact us to learn more about this SW Calgary neighbourhood.